So far, the drama of Thailand’s military takeover has played out mainly in the political arena. BANGKOK — When Thailand’s military staged a coup last week, Phil Koenighaus was on a beach enjoying the debauchery of the country’s infamous “Half Moon” festival. Not a soldier was in sight on the white sands of Koh Phangan and the raucous party that attracts revelers from around the world carried on for hours. After shaking off the effects of too much celebration, the German backpacker headed from the island to Bangkok, unfazed by the military takeover. So far, the drama of Thailand’s military takeover has played out mainly in the political arena. As the army summons journalists and academics seen as anti-coup, detains ousted political leaders and issues stern warnings on TV, tourists are kicking back on the country’s famed beaches and sightseeing in Bangkok. The main impact on visitors for now is a 10 p.m. curfew, which forces nightlife to close several hours earlier. “It’s really like nothing’s changed, except you have to go home before 10,” said American tourist Rosemary Burt. Burt and her daughter, from Gilbert, Arizona, were roaming around the ornate Grand Palace in Bangkok, before heading off to other sites and then a pre-curfew dinner. It was a normal day at the Grand Palace as tuk-tuk touts outside tried to swindle tourists with inflated rates and only the usual security stood guard. 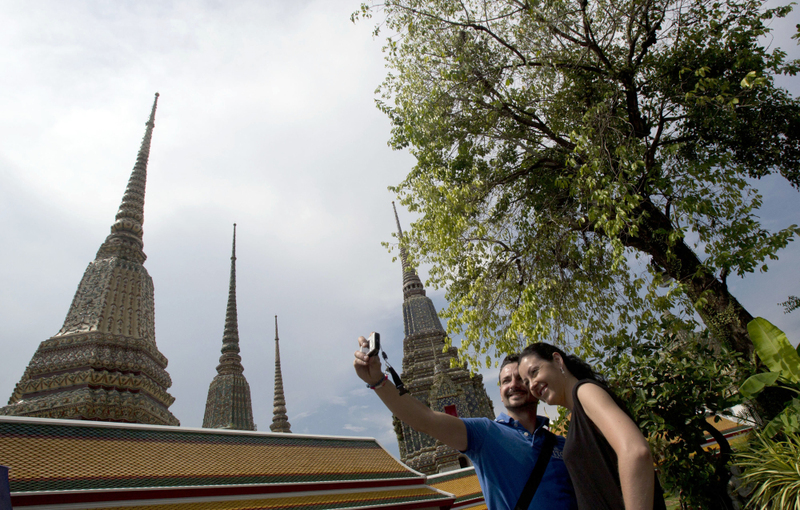 For Thailand’s tourist industry, however, the situation is more ominous. Bookings were already down after six months of anti-government protests in Bangkok, and the combination of coup plus curfew along with uncertainty over how long the crackdown will last could be bruising, hotels and industry experts say. It’s a blow the economy, already struggling, could do without. Tourism accounts for about 7 percent of Thailand’s economy and provides more than 2 million jobs. The industry has been resilient despite a decade of political turbulence. A record 26.7 million visitors came last year, up 20 percent from the year before. But political protests that escalated in November led to a 6 percent drop in foreign tourist arrivals from January-April this year, said Piyaman Tejapaibul, president of the Tourist Council of Thailand. Piyaman has petitioned the ruling junta to lift the nightly curfew at beach resorts including Phuket, Samui, Krabi and Pattaya. “Everyone in the country, especially in the tourism sector, hopes military rule is lifted soon and democracy restored,” she told the Phuket Gazette newspaper. More than 40 countries have issued travel alerts, including the U.S. and Hong Kong, which have advised citizens to avoid non-essential travel to Thailand. In Hong Kong, a major source of visitors to Thailand, the Travel Industry Council reported that travel agents canceled at least 70 tour groups this week involving 1,300 people. Hotels in Bangkok say the coup has kept them busy — with nonstop cancellations. The 5-star hotel is offering promotions it calls “Staycations” to entice locals to come for drinks or dinner and spend the night — and avoid rushing home for curfew. The Swissotel Nai Lert Park has announced a similar “Beat the Curfew” rate for residents through June. Hotels say they are waiting for events to unfold before slashing rates for overseas visitors. The junta warned this week that it won’t tolerate dissent or protest, raising concerns of a crackdown on anti-coup protesters. Other businesses that cater to tourists are finding various ways to adapt. The go-go bars in the Patpong red-light district are opening three hours earlier than usual because the curfew clears out customers by 9:30 p.m.
As curfew approached Monday night, the blaring music stopped along Silom Road, where side streets are crammed with clubs, pubs and restaurants. As the neon lights switched off and tourists emerged trying to flag down taxis, a few bars tested the curfew and stayed open.